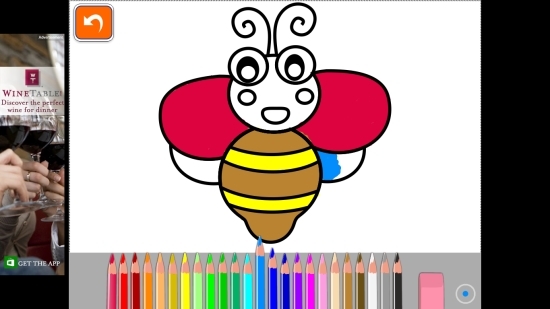 Kid Coloring Book is a free Windows 8 Coloring Book app for kids that lets your kid enjoy an amazing coloring experience on your Windows 8 PC. The app has a set of inbuilt sketches of fruits, animals, and other objects to fill colors. There are as many as twenty-four bright pencil colors to choose from. This free Windows 8 Coloring Book app is very interesting and addictive. It’s simple to operate and appropriately designed for small kids with a nice bright interface. A variety of drawings make it exciting for kids to choose from as per their interests. Kid Coloring Book is freely available in Games category of Windows Store. You can click on the link given below at the end to view the app directly in Windows Store. 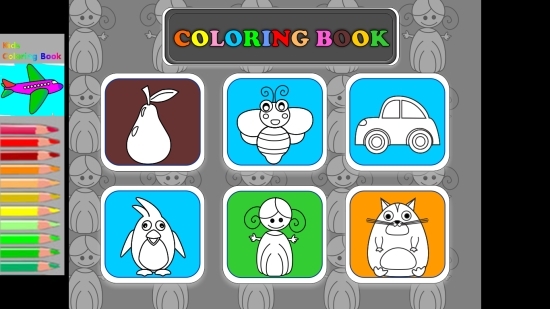 Let’s have a quick look at this exciting free Windows 8 Coloring Book app. As you land on the app’s Start screen, you will see a set of pictures arranged on the screen as colorful tiles. The background will have one of the images moving diagonally giving it an animated effect. Double click on a picture you want to color. The next screen will open up with the selected picture. You will also be provided with twenty-four bright colors and an eraser below. Double click on a color to select it. Now, take your mouse on the area where you want to fill that color and make a click. Similarly, select different colors to fill your picture. You can use eraser to remove any unwanted color that is spread out of your picture. You can double click on the back arrow icon to go back to the main screen. Kid Coloring Book is a very interesting Coloring Book that offers a variety of drawings and bright colors to give your children an exciting fun-coloring experience. Although, it offers a limited number of pictures to fill colors, but kids can fill them again and again with different colors. However, an important feature of saving these colored pictures is missing in the app that may disappoint your kid a bit. But otherwise, it is a nice app. Give it a try and let your kid play with colors. Share your feedback via comments. Get Kid Coloring Book here!